"In the beginning God created the heavens and the earth...Then God said, "Let us make man in our image..."" (Genesis 1:1 & 26) Thus the thunderous sky rolled back; the earth shook, the mountains trembled...and Michelle was born. That is just the prelude to a story filled with glorious adventures and exploration in art. It is wonderous to take in your hands tools and materials; filled with erupting visions and a stirring in your heart,and begin putting things together that have never been made. Creation. The energetic process of drawing brings about feelings of elation and satisfaction only surpassed by the Universe giving energy to Her children. 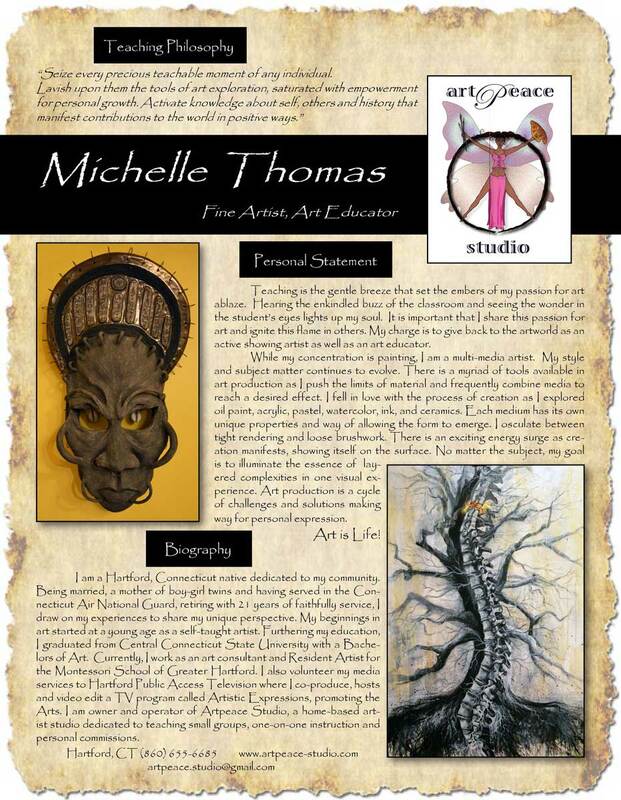 "By the seventh day God had finished the work He had been doing; so on the seventh day He rested..." (Genesis 2:2) By the eighth day, using inspired knowledge of those before her, Michelle began creating!